I love Lauren Child's work. I fell in love with Charlie and Lola when my daughter started watching the series on tv. I think her collage artwork is stunning. 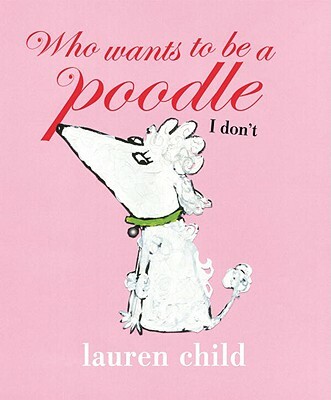 So really, I am a huge fan so I was ultra-disappointed when peaceful girl and I settled in to read her latest, Who wants to be a poodle-I don't!! The front cover definetely drew us in but right in the first few pages we were thrown. Peaceful girl is working very hard to be a reader and it has been her practice of late to read the first few pages of our bedtime books. She had just recently read me a Charlie and Lola book and she felt confident she could read this one. Her little face fell on the very first page of print though as it is written in fancy cursive script and she said so "can't read that"! Well, we got past that as I pointed out printed sentences she could handle and we did read it together, but it was a struggle. The story line is wonderfully imaginative-really, a poodle who wants to be more daring, what a fabulous idea!! This time though her artwork goes over the top and makes it difficult to find and read the words. Peaceful girl still liked the book and for all Lauren Child's fans you will also. For an elementary library though I would rate it 3 out of 5 just because students will have difficulty reading it on their own and it won't make an easy read-aloud for teachers. More accomplished readers will find it fun and challenging. Synopsis: Trixie Twinkle Toes lives in the lap of luxury, with every creature comfort a manicured paw away. Adored by the glamorous Mademoiselle Bruleé, the little poodle has a maid to plump her pillows and a cook to prepare her nibbles. But Trixie isn’t happy. She doesn’t like the puffing and poofing and preening. She doesn’t like being dressed in little pink ponchos. She wants to be dazzlingly dangerous and daring. She wants to step in puddles! With a witty text that scampers across the pages and hilarious mixed-media illustrations, Lauren Child offers a one-ofa-kind treat — sure to entice both spirited little readers and deeply devoted dog-lovers alike.